Don’t every give up, enjoy the process and try to have fun along the way – otherwise, whats the point? Don’t edit as you go – it kills momentum! 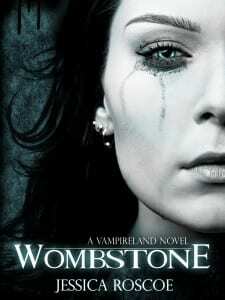 Jessica Roscoe is the author of Wombstone, a Young Adult paranormal novel. From a young age, she delighted in the written word and would often scare her poor parents with outlandish stories filled with the supernatural and macabre. Jessica studied film and screenwriting at university before deciding that novels were her calling. The setting for Wombstone was inspired by a six-month stint in the U.S. where she worked as a lifeguard at a summer camp in Mount Freedom, New Jersey. She is currently working on the next book in the Vampireland series. Her other loves in life include good quality tea, wine, reading and hanging out with her husband and baby girl. I lived in the US for six months while working at a summer camp (I’m from Western Australia). While in New Jersey, this character came to me – Mia Blake. She pretty much forced me to write her story!